Yet what does this vision and associated plan say about how integrative pediatricians will respond to such an imperative? To get answers I contacted integrative pediatrician Larry Rosen, MD. 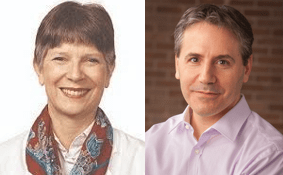 Rosen and his long-time colleague, fellow pediatrician, academic integrative medicine leader, author and researcher Kathi Kemper, MD, MPH, helped found the Section on Integrative Medicine at the AAP. They participated in a grant-funded leadership initiative to set a 10-year strategy for the field in 2004 that was funded by the George Family Foundation. Just over a decade later, with the support of the Marino Health Foundation, the two re-entered a process to convene leaders to examine the field’s advances, again in concert with the AAP, leading to the present document. The declared need is powerful, and the context irrefutable. But what is the role of a subset of pediatricians who choose practice integratively to do? The following is edited from an interview with Rosen that he had the opportunity to review and edit for clarity prior to publication. Weeks: What was the timing – why now? Rosen: We had an interest in looking back to inform a vision plan for the next growth cycle. We did a 10 year plan in 2004 at about the time the AAP Section was formed and thought it would be good to re-group. We were grateful to get support from the Marino Foundation for the retreat. Weeks: Who was present? Was it the same group? Rosen: Many of the 15 pediatric integrative medicine leaders were either present at the earlier meeting or became involved shortly after. Virtually all are academically-based. We also intentionally invited newer leaders in the field, as sustainability was a concern. We did this work again in association with the AAP. As a full-time clinician, I was something of an exception. This time we broadened our inputs in a few ways. First, as you know, we reached out to the Academic Collaborative for Integrative Health. The Collaborative helped us in identifying leaders in pediatric care from chiropractic, acupuncture, naturopathic medicine who added some great perspective. We surveyed them, then Kathi and I held a long conference call prior to our retreat. We reported what we discovered at the retreat. Weeks: Any key contributions you might share? Rosen: The 15-member interprofessional task force encouraged us to deeply consider the benefits of a respectful, interprofessional approach to optimize children’s health in the future. We followed up with a conference call and report after. Weeks: The other methods for broadening were through surveys? Rosen: In conjunction with Kiwi magazine, we conducted on online survey of a sample of parents solicited through Kiwi’s Mom’s Meet network. We reached 1500 parents. Less than a quarter of even those parents who were friendly toward natural health had any idea of what “integrative medicine” is. 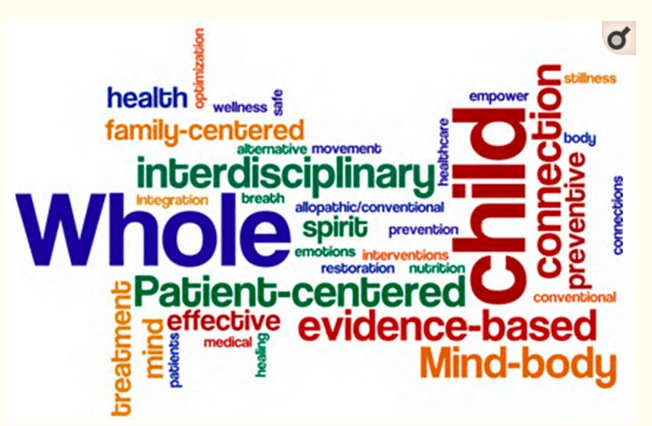 Once they knew what is meant, only one in seven identified their pediatricians as integrative. Their top interests in integrative modalities were in nutritional and behavioral counseling. Nearly 70% however believe that integrative qualities are something they want in physicians. Weeks: Any surprises in the survey of 93 health professionals in your survey? Rosen: Most were seasoned veterans, culled from a longstanding pediatric integrative listserv community I started in 2004. More than 75% stated that currently available online resources were not sufficient to support their practices. Weeks: The integrative pediatric vision statement includes a list of 7 principles that define the field – preventive, context-centered, relationship-based, personalized, participatory, sustainable and evidence-informed. Where these all from 2005 and if so did you add or shift any of these? Rosen: These are core principles I’ve developed over the years based on input from other leaders and from what I’ve seen work in practice. They’ve been our key guideposts from the beginning. Some of the language has shifted, that’s true. Weeks: Nice to see the “evidence-informed” language. That’s appropriately humble, for all of medicine. Rosen: There was discussion about whether “evidence-based” was a more well known or accepted term in conventional pediatric circles. Thanks to Sunita Vorha, who really educated us about the differences, “evidence-informed” prevailed. Weeks: You all set a course – with a key call for an independent organization to take the lead in promoting an expansive agenda of resource development, a web portal, and perhaps a consultative service for new members setting up practices. Is there action on this? Rosen: This was our top wish-list item, and we all knew it was a reach. Maybe more towards the end of the 10-year vision cycle. The problem is resources- both time and money. I don’t think much will happen unless we can secure these. It’s a multi-million dollar proposal and it needs a sustainable leadership plan to get it off the ground and functioning long-term. This kind of change won’t happen overnight and it’s not a low budget item. We’re talking about sustainable health care system transformation so that the next generation is healthier than we are. That’s not where we’re currently headed. Weeks: I wonder – is the vision of the organization open to practitioners from other disciplines, or is it limited to medical doctors? Rosen: Yes, absolutely. Even though the meeting was hosted by pediatricians for pediatricians, we all are committed to the bigger picture. We need all of us – including the kids and parents –for true change to happen. Weeks: Those seem good, interprofessional and circle-widening steps. I understand the needs outlined and the kinds of sober, brick by brick recommendations for next steps in the report. But they seem boilerplate somehow – not unlike the white-boarded outcomes of so many other gatherings over the years for how to advance an integrative practice field – right down to the need for capital partners! Rosen: I get it. I don’t want to downplay the value of the report. We’ve come a long way. For instance, we have the Pediatric Integrative Medicine in Residency 100-hour program that has over 500 residents nationally now. But we have a long way to go, especially when you look at health metrics for children today. For me, personally, this was a wake-up call. I don’t think that the dominant system of medicine is prepared or yet preparing to help families with what they need today. Weeks: This kind of judgement and language is not in the report. Rosen: The report addressed a specific fraction of what was discussed at the meetings, geared to a conventional pediatric audience. I would argue that the recommendations that are included – all expressed in the context of academic pediatrics – are all necessary, but not sufficient, for what the group envisioned. Personally, I continue to struggle with the idea of working within or outside the system. There is such value working within, especially in serving the underserved. Then I think of initiatives that have popped up after our retreat, when this paper was in pre-publication. One was the George Family Foundation’s decision to fund health and well-being through YMCAs. Then Taylor Walsh connected with me on his wellness in the schools project that is looking at how we can get well-being skill building built into the education system. These are exciting directions for our children. Weeks: Put yourself, realistically, a decade into the future – make it 2025. Where is the integrative pediatrics field? Rosen: I’d like to see this work happening under the guidance of a full-time organization devoted fully to children’s health from an integrative philosophical perspective. We can’t make this kind of change happen as a small minority interest within a large pediatric group or a large mostly adult focused IM group. I am increasingly certain that true transformation will only happen with full partnership among all stakeholders – all professionals and all patients and families. A top down approach has not led to sustainable real change, and I don’t believe it will. We need to prioritize health promotion from birth on, delivered in community settings including schools. That’s the future I’d like to see.